Adventures in the Endless Pursuit of Entertainment: Blithe Spirit Conjures a Logo! Blithe Spirit Conjures a Logo! BroadwayBox discount in hand. 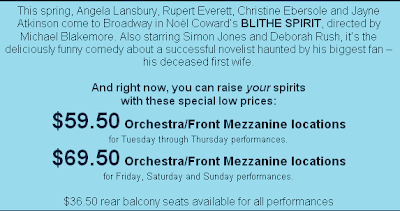 The only thing mystical to me is that while Playbill says it's an open ended run, the BroadwayBox discount alert says it's a limited engagement for 20 weeks only. Now, that's spooky. Let me know what you think of this show. Might be a reason to bring me back to the city.